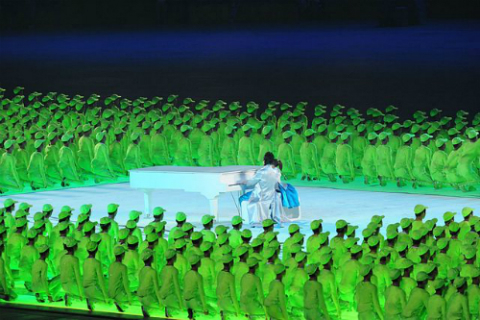 Lang Lang performed for the opening ceremonies for the 2008 Olympics. Now, picture him onstage with four scruffy guys. Actually, let me tell you what to think: it’s awesome. Metalheads and classical nerds have way more in common than they realize. Both love those deep, edgy, endless hooks (Beethoven 5 anyone? riff city) and both the metal and classical forms tend to be complex and heavy. Both have rabid fans. Lang Lang and Metallica will be brief, full of histrionics, and maybe forgettable. It certainly won’t be worse than this. Update: Performance is up (for now). Nice when it hits at 5:12.